Best Family Costume Entry... Both costumes were based on Madeline Hatter and Bunny Blanc from Ever After High. I made my daughters entire costume and brought a few items for mine. Both tutus the material all came from Joann's and Hobby Lobby. I used fabric paint on my skirt to make the clock design. The top hat is made with cardboard, a headband, and fabric. I brought the bunny ears and vest. I added rhinestones on the white tights that my daughter is wearing. Her shirt I made from scratch. I brought the little charms from Hobby Lobby and added them to the costume. 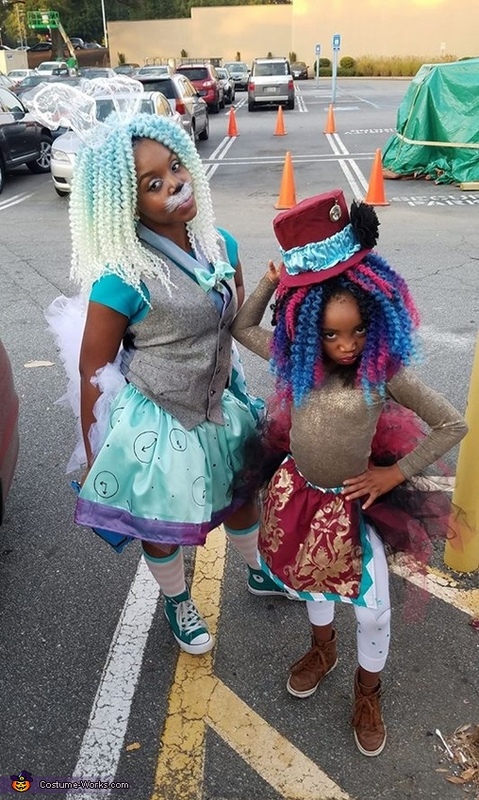 I made both wigs with ombre synthetic hair and crocheted the hair onto the wig caps.